Today we also shipped the Expression Encoder 1.0 release on the web. Expression Encoder is part of the Microsoft Expression suite of products, and enables designers and content professionals to enhance, encode and publish media content for Silverlight. You can use it to import media files from a variety of formats (QuickTime, WMV, AVI and more), add leaders and trailers to videos for advertising or roll credits, easily watermark video with corporate logos or brands, and then tune the encoding settings to create optimal web-friendly Silverlight experiences. This week we'll have a wide range of customers already deployed live on the Silverlight 1.0 release. A few of them include: MLB.com (Major League Baseball), Home Shopping Network, World Wrestling Entertainment, and the "Entertainment Tonight" show. 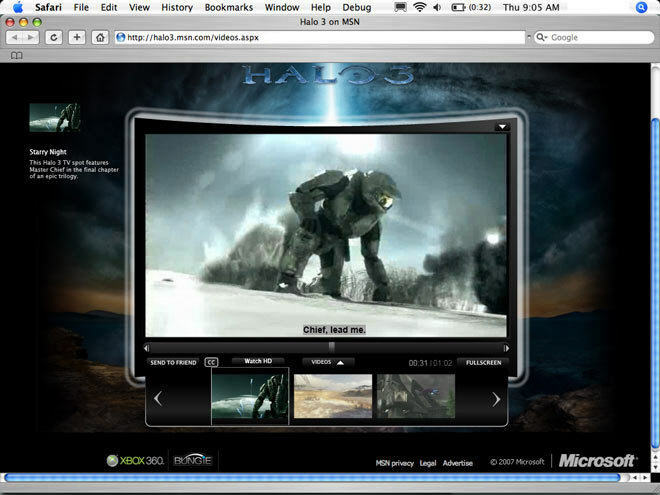 Silverlight is also now deployed on several Microsoft sites, including the Halo 3 preview site (click here for the awesome HD version), Tafiti.com, MSN Extra, and MSN Podium '08. You'll also see Silverlight used prominently in several upcoming MSN and Microsoft.com sites. Keep an eye on Miguel de Icaza's blog - I know he'll be blogging a lot more about our partnership on this shortly. Now that Silverlight 1.0 is out the door, my team is cranking hard on our Silverlight 1.1 release. Silverlight 1.1 will include a cross-platform version of the .NET Framework, and will enable a rich .NET development experience in the browser. It will support a WPF programming model for UI - including support for an extensible control model, layout management, data-binding, control skinning, and a rich set of built-in controls. It will also include a subset of the full .NET Framework base class library you use today, including support for collections, generics, IO, threading, globalization, networking (including sockets, web-services and REST support), HTML DOM, XML, local storage, and LINQ. Congrats on the Silverlight 1.0 release! I'm really happy to see the Moonlight partnership has been made official - it's a great solution for everyone. please elaborate more on the 1.1 update because we're working on a full silverlight webapp. As of now we're working our way through the current silverlight limitations (mainly, the lack of basic text input controls and built in support for tabbing (tabindex -> "tabkeydown" is not supported). Besides that, there doesn't seem to be any focus-support on any other element besides the root canvas. So please elaborate a bit more. Oh, and of course, maybe an expected release date. This is great news...are there any firm (or at least not entirely abandoned) plans to produce a version of 1.1 for mobile devices? It'd be a great way to help Windows Mobile compete with the dreaded iPhone. >>>>>>> please elaborate more on the 1.1 update because we're working on a full silverlight webapp. As of now we're working our way through the current silverlight limitations (mainly, the lack of basic text input controls and built in support for tabbing (tabindex -> "tabkeydown" is not supported). Besides that, there doesn't seem to be any focus-support on any other element besides the root canvas. The Text Input control and focus/tab support will be coming in future Silverlight 1.1 refreshes. That support isn't in the alpha today - but we will be supporting it in the future. >>>>>>> This is great news...are there any firm (or at least not entirely abandoned) plans to produce a version of 1.1 for mobile devices? thanks for your answers. So any news on the "focus" support on elements other then the root-canvas. And maybe a possible release date? So that we know whether to continue developing our own workarounds for the textbox en tabbing. The 1.1 refreshes from MIX to now have mainly just been updates to keep in sync with the Silverlight 1.0 code-base. Now that Silverlight 1.0 has shipped, the upcoming refreshes of 1.1 will be feature updates with more functionality. So you'll start to see more functionality appear soon. >>>>>> thanks for your answers. So any news on the "focus" support on elements other then the root-canvas. And maybe a possible release date? So that we know whether to continue developing our own workarounds for the textbox en tabbing. Unfortunately I don't have an exact ETA on when text box focus support will come online - although the textbox control itself will show up in a refresh later this year (I'm not sure if focus management will be there immediately or come afterwards though). Those are great news, Scott. I'm really looking forward to seeing Silverlight 1.1 get out of its alpha! Really great job! Congratulations, this will have one impact on the future of web!! The release is good news but it doesn't seem to support Internet Explorer 64 bit edition on Windows Server 2003 x64. Should there be support and if so when can we expect it? When you say "You can point Silverlight at any URL containing video/audio media content, and it will download it and enable you to play it", does this mean that the cross domain security policy has been dropped ? Or does the content still have to reside at the same host that the Silverlight control is served from. >>>>>> When you say "You can point Silverlight at any URL containing video/audio media content, and it will download it and enable you to play it", does this mean that the cross domain security policy has been dropped ? Or does the content still have to reside at the same host that the Silverlight control is served from. Where you run into domain restrictions is where you want to download two separate code files from two different servers. In that case the browser will isolate the two scripts and not allow them to participate together to avoid cross domain scripting issues (just like regular AJAX today). But for media scenarios you can definitely download the media files from different domains than your site server. >>>>>>>>>>> But for media scenarios you can definitely download the media files from different domains than your site server. That means the MediaElement is able to play also streaming files from Media Server using rtsp protocoll ? Great news to read that Encoder is ready. Till now I cant download it. I got the link to old preview version. A couple of question about encoder: does it allow live encoding ? Is it possible to capture from TV cards using BDA drivers ? Any chance to support it in future ? That means the MediaElement is able to play also streaming files from Media Server using rtsp protocol ? The halo3 site won't let me put in my date of birth! It only works in IE. Cross platform? Cross browser? Linux and Mac OS X? a wonder! who are you and where is bill gates? Will any code written for the beta break with this release? That's why I love Microsoft, and that's why they are the best. Are you planning support MatrixAnimationUsingPath in further releases ? Will Expression media encoder replace Windows Media Encoder ? now that Expression Encoder 1.0 is here when will be ready an SDK to embed EME into an application ? I keep seeing references to it which makes the whole thing a bit confusing. The 1.1 SDK says September refresh, the link takes you to the July refresh. Has any general release timeframe been announced for Silverlight 1.1? Generally, are we talking 1H2008, 2H2008, 1H2009 ...? You said, "Silverlight 1.1 will include a cross-platform version of the .NET Framework..."
Could you elaborate? What platforms will this cross-platform version support? Is this version all MS code or, like Moonlight, does it rely upon 3rd parties (e.g. Mono)? How much of the .NET framework will be included? ASP.NET 2.0 and ADO.NET 2.0? With this version of the framework, will I be able to take web apps built in VS 2005 and run them on a Linux box w/o having to go through a "set up, deploy, and test on Mono" phase? Will 1.1, in Orcase, have all the controls to drag and drop onto a design surface like we are used to in regular asp.net construction or is that something we need to get from Expression Blend? I'm referring to the final product, not the alpha, if you can comment. Supporting Linux is huge. Now you will have Linux guys coming to Windows to develop SL for Linux. What a great partnership. Thanks for "G R E A T" work! Is the Encoder provided as part of any MSDN Subscription? Or is it only available by purchase? What about development tools for Silverlight 1.0? I guess VS 2008 will come with Silverlight 1.1, because 1.1 uses .NET Framework 3.5 features as well. Will somehow MS release tools and add-ons for VS2005? Thanks for all the fantastic work on Silverlight. I guess hell really froze over with the Novell cooperation announcement. I’ve slowly seen the transformation going on in Microsoft over the years, and your blog along with others have made this possible. Now we can finally start working on old ideas which were just impractical to implement before Silverlight. Do you know if there is any chance support for mpeg 1? Mpeg 2 is probably out of the question because of the licensing issue. Ok, let's be blunt and hope you'll be as open and honest as ever. Are you willing to, say eat you left shoe if Microsoft will stop supporting Mac and/or Linux while continuing to support Windows? I'm of course referring to Internet Explorer, Windows Media Player and VBA for Office. It works on my Mac at home, running OSX and Vista, but not on my work machine running Windows 2K. Go figure. It is wonderful that Silverlight has Linux support. Looking forward to the future of this product. Congrats on the release. I'm looking forward to seeing some cool social apps built with it. >>>>>> The release is good news but it doesn't seem to support Internet Explorer 64 bit edition on Windows Server 2003 x64. Should there be support and if so when can we expect it? You'll want to use Silverlight in the 32-bit Internet Explorer process on x64 systems. Most browser plug-ins (including Silverlight, Flash, Java and almost all ActiveX controls) only work in 32-bit browsers currently. >>>>>> So where do I download it from?!! If I go to silverlight.net or on Microsoft's site (www.microsoft.com/.../downloads.aspx) all I see is the RC. Where's the final product? The final 1.0 release is now on the download center (last night the downloads were also the final v1.0 bits - although the graphics still said RC). >>>>>> Will Expression media encoder replace Windows Media Encoder ? I believe Expression Media Encoder uses the saw encoder codecs as Windows Media Encoder - but provides more designer features, scripting automation, and richer features like watermarks and ad-inserts. Silverlight 1.1 includes a cross platform version of the .NET Framework and enables a rich .NET programming model within the browser. >>>>> Has any general release timeframe been announced for Silverlight 1.1? Generally, are we talking 1H2008, 2H2008, 1H2009 ...? 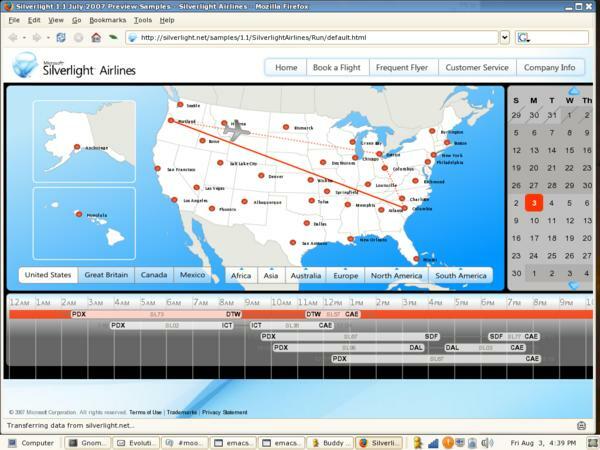 We haven't announced any specific dates yet - but Silverlight 1.1 will ship in 2008. >>>>>> You said, "Silverlight 1.1 will include a cross-platform version of the .NET Framework..." Could you elaborate? What platforms will this cross-platform version support? Is this version all MS code or, like Moonlight, does it rely upon 3rd parties (e.g. Mono)? How much of the .NET framework will be included? ASP.NET 2.0 and ADO.NET 2.0? With this version of the framework, will I be able to take web apps built in VS 2005 and run them on a Linux box w/o having to go through a "set up, deploy, and test on Mono" phase? Silverlight 1.1 includes the same CLR engine that is in the full .NET Framework, and then a subset of the .NET Framework class libraries useful for web development. It doesn't include server-side components like ASP.NET and ADO.NET - but it does include a UI framework, client web-service stack, LINQ, XML and core networking functionality. This is all Microsoft code on the Silverlight implementations we ship for Windows and Mac. The Moonlight implementation for Linux uses the Mono CLR and framework library. >>>>>>>> Will 1.1, in Orcase, have all the controls to drag and drop onto a design surface like we are used to in regular asp.net construction or is that something we need to get from Expression Blend? I'm referring to the final product, not the alpha, if you can comment. We will have WYSIWYG designers for building Silverlight UI in both Visual Studio and Expression Blend. Those aren't enabled today - but will be coming in the future. >>>>>> Is the Encoder provided as part of any MSDN Subscription? Or is it only available by purchase? The Encoder product is currently only available with MSDN Team Suite Subscriptions (although Expression Blend and Web are available in MSDN Premium). Alternatively you can also purcahse Expression Media and Encoder separately. >>>>>>>> What about development tools for Silverlight 1.0? I guess VS 2008 will come with Silverlight 1.1, because 1.1 uses .NET Framework 3.5 features as well. Will somehow MS release tools and add-ons for VS2005? Silverlight is absolutely a cross-platform strategy, and will never be Windows only. One of the reasons we partnered with Novell to deliver the Linux version was to ensure that we had a partner who was extremely comitted to delivering a super high quality Linux implementation. Novell will own the Moonlight implementation (and make the source code for it available under a LGPL license) - ensuring that it can never be stopped. >>>>>>> I've worked my fingers to the bone, cried, screamed and stomped my feet but still Microsoft insists on lying by publishing incomplete and fraudulent requirements documents resulting in it becoming impossible to determine why Silverlight will not install on a machine with an Athlon CPU running XP Pro SP2. Are you running the 32-bit version of Internet Explorer? You'll want to-do this when running browser plugins like Silverlight (or Flash, Java, or ActiveX). If you do this it should work fine. Sorry for the confusion there - we had an issue propping some final content updates on the www.microsoft.com site this morning. It should be fixed now. The Halo 3 site doesn't work properly under Firefox - when I try typing in my birth date it does a Quick Find instead. >>>>>>> Do you know if there is any chance support for mpeg 1? Mpeg 2 is probably out of the question because of the licensing issue. Good question - right now we don't have plans for MPEG 1 or 2. The main reason is we are trying to keep the Silverlight download size to be as small as possible (since people are less likely to download larger packages). 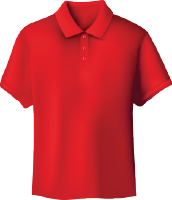 As such we are keeping our built-in media codecs to a small set of popular formats that are web friendly. However, you might be able to use Expression Encoder and transcode MPEG 1/2 media to VC-1 - which would then work. >>>>>> Hi Scott, now that Expression Encoder 1.0 is here when will be ready an SDK to embed EME into an application ? Good question. If you can send me email (scottgu@microsoft.com) I can put you in touch with the Expression Encoder team to find out. >>>>>> A couple of question about encoder: does it allow live encoding ? Is it possible to capture from TV cards using BDA drivers ? Any chance to support it in future ? Yes - Encoder 1.0 supports live encoding. I'm not 100% sure on the BDA driver question, but if you send me email (scottgu@microsoft.com) I can put you in touch with the Expression Encoder team to find out. >>>>>>> The Halo 3 site doesn't work properly under Firefox - when I try typing in my birth date it does a Quick Find instead. Thanks for reporting that - we'll get it fixed. The problem is not with Silverlight, but rather with the html prompt the site puts up to enter your birthdate if if you are on a slower network (so as to allow the video to download some in the background). I just forwarded a message off to the Halo3 team to make sure they test this and update the site to fix it. 1) Will Silverlight 1.0 plugin auto-update to 1.1 when it finally comes out? The Silverlight Get Started page says that there's a September Refresh to the 1.1 Alpha, but the link takes me to a download page that downloads the same file as the previous refresh. There's also a link to a September Alpha Refresh version of the 1.1 SDK, and that does appear to be a September version of a refresh, but I haven't looked that far into it. What's the official word on a September Alpha Refresh? Good to hear that. That was really a great news. I got more enthusiastic when I heard that will be available for Windows, Mac, and Linux. And even compatible for Firefox and Internet Explorer Browsers! Is silverlight support 3D rendering and texturing like Open GL ? Any API/SDK support for 3D ? Thanks for your reply Scott. It seems that Moonlight will use a slightly different approach when decoding video, if the video is not vc-1 or wmv they will fall back to using ffmpeg (or another decoder) and still render the video. Could that be a potential solution for Silverlight also? (Try to use pre-existing codecs installed on the client computer if the video format is unknown to Silverlight). By reading the Linux forums they actually have a good point, if Moonlight supports more video codecs and is 100% compatible with Silverlight, then why install Silverlight? I'm glad to see SilverLight 1.0 is final now. Mainly because that leaves more time for you guys to develop SilverLight 1.1. I really like the way SilverLight 1.1 works with .Net. I'm wondering if SilverLight 1.1 will support (clientside) webcams. I'm working with Adobe Flash now, which allows me to use the users webcams (using Flash Media Server). Since I like the whole .Net/Silverlight way a lot more than the ActionScript/Flash way, I'd like to start using SilverLight 1.1 as soon as it's final, but to do this, I need the webcam functionality. I hope you can shed a light on the whole webcam support issue. Hi Scott , Does this version support unicode charecters? Very exciting. We too however will have to wait for 1.1 because user controls are a must for any real-world application deployment. Once it's out though the option seem endless so I personally can't wait. A date would be very nice (even rough estimate). Question here, I know Silverlight animations are time based, but am I right to say that it is also frame based and script based, looking that it also has stuff like keyframes shown in Blend, and script based as it the animations are stored in storyboards within XAML? Giving the codecs over is nice too, please take note of the comments on supporting stuff like voribis/ogg too! I really appreciate the Silverlight hype. Scott, can you comment on the availability of a networking stack in Silverlight 1.1? I have been investigating Silverlight as a client platform for Games development, however, need to be able to work with persistent network connections to make this work. I could use a dummy client web request and send data to the client from the server along with keep-alives, but would much prefer not to have to resort to such hacks. I know Flash has a decent socket library, which is used extensively for all sorts of interesting things, and it's terrible to see this missing from the Silverlight 1.1 API. Fantastic news that you guys are finally accepting Linux as a platform that needs to be supported. I hope this will translate into a wider acceptance and support for the Mono project and .NET on Linux in general, including the porting of the .NET 3.0 APIs (which is currently prohibited using patent and licensing issues). Wow, your teams have been really busy! I haven't gotten a chance to use WPF or Silverlight 1.0 or 1.1 alpha yet. This questions probably has been already asked but is Silverlight 1.0/1.1 a exact subset of WPF or does it diverge in areas. I understand that 1.1 has built in UI elements/controls are they a true subset of WDF's controls? Wow. From your description of Silverlight 1.1 it's sounding less like a rich-media plugin and more like an applet because of how you describe using any .NET framework language. What I'm wondering is, where will the line be drawn by what can be accomplished using a windowed application that cannot be accomplished with Silverlight, and vice-versa. What type of access to the client computer can Silverlight applications attain (file system, printers, etc) and what kind of security is in place (or where can I look this stuff up)? Cannot stress the point mentioned above re Silverlight supporting WebCam functionality as Flash does. Not concerned about formats too much - just needs to do it. I can understand issues around access items outside sandbox (webcam) - I read somewhere you are pushing the fact that Silverlight does not have all these secuirty prompts. You would need one for Webcam access. We need browser based video recording and would like it to be with Silverlight rather than Flash / Flex. How does LiveStation fit in with the SilverLight / video. Will Silverlight support P2P file tranfer? Grats on the Silverlight Release! I'm looking forward to the next refresh of Silverlight 1.1 where Text input fields and foucs and tabindex should be available. Any thoughts on when the next alpha 1.1 refresh or final 1.1 release of Silverlight is hitting the world? >>>>> Grats on the Silverlight Release! I'm looking forward to the next refresh of Silverlight 1.1 where Text input fields and foucs and tabindex should be available. Any thoughts on when the next alpha 1.1 refresh or final 1.1 release of Silverlight is hitting the world? We'll have an update later this year with more features. A lot of the big infrastructural pieces are starting to come in now (layout, text input, focus management, etc).